This Miraculous Medal rosary with matching Miraculous Medal rosary box makes a great gift for any occasion. 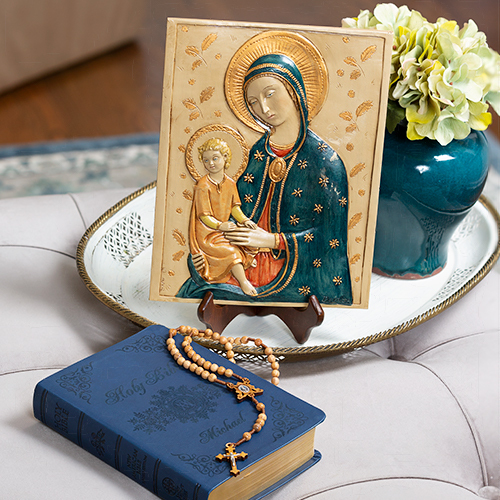 The Miraculous Medal rosary features the Miraculous Medal image with blue enamel background on the centerpiece, crucifix, and Our Father beads. Each Hail Mary bead is silver and cube shaped with a cross on all four sides. The rosary box is also miniature sized and features a silver Miraculous Medal on the lid with a decorative blue enamel floral border and wavy edges. 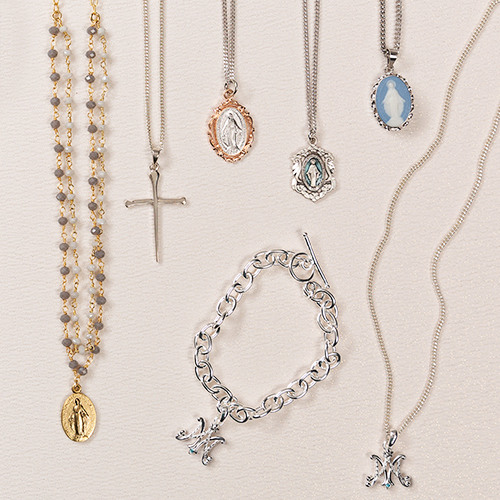 The Miraculous Medal rosary makes a great gift for children and adults alike! Rosary box measures 1.77" x 1.77"
I ordered 5 of these, 4 being given away as gifts and 1 to keep for myself. I was not disappointed. The details in the cross, the decade beads and the Hail Mary beads are just beautiful. I love the smaller size length of the rosary too. In its case, it fits perfectly in a zippered pocket in my purse so that it is readily accessible. 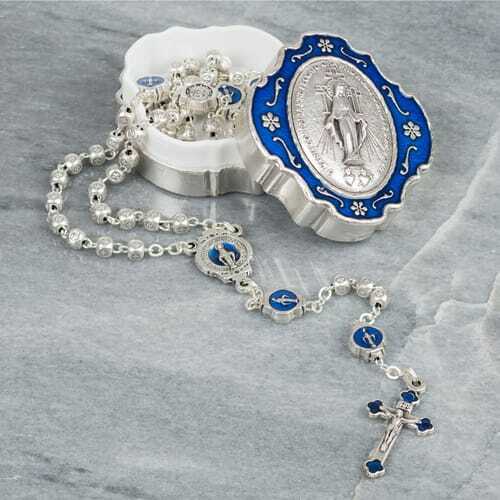 The case is intricate in its design of the miraculous medal and the blue and silver detail. Truly a rosary to honor Mary especially during the month of May. This rosary and box were as described. It is a nice small rosary, and I gave it to a petite adult who has small hands. It would be good for a child as well. I gave it only 4 stars because of the cost and because of the box. The box is fine, but it was not a "wow." Love this rosary as it fits in my purse just perfectly, has a beautiful silver color with blue, looks just like the picture. I bought this for my mother. 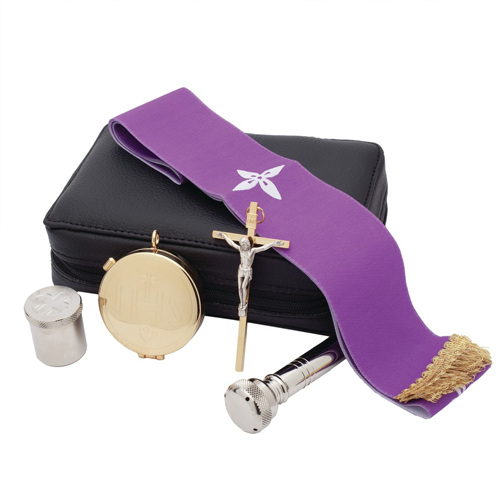 The rosary is beautiful and the case is perfect for someone who tends to lose rosaries!! This Rosary is beautiful and I love it. I also love the case it came in. It is special to me. I use it daily. I also love the touch of blue in it. I highly recommend others to purchase it for themselves or for a gift. The price is very good for such a nice product. 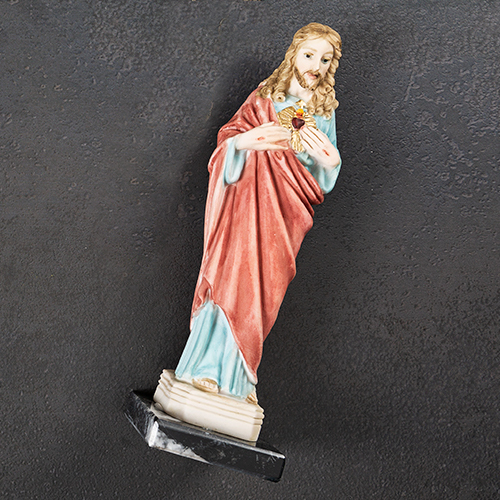 Thank you The Catholic Company! The rosary is beautiful...It is everything I wanted as a gift to someone very sick. I know it will help her. Bought this rosary for my sister and I just love it the first time I saw it. Wanted to keep it for myself. :) It's small, dainty and absolutely beautiful! A must-have!! Unfortunately, the "confucimus" (confuses) SHOULD be confugimus. Qui ad te confugimus = who have recourse to Thee. It would be confusing indeed for someone to try to translate this! Especially a newbie. This is the 2nd time I have purchased this rosary, one for me & one for my daughter. It is absolutely beautiful & very convenient to carry with you & very well made! I LOVE IT! I a extremely satisfied with my purchase it is more that just what I wanted. It is just what I needed. I gave this as a gift to someone named Catherine (since Saint Catherine Laboure was told to design the Miraculous Medal). She was delighted to receive it. This box with its matching rosary is both beautiful and unique! Although the item was smaller than my mind had pictured it, it is beautiful and delicate. I broke my rosary the day before (it was something I had had for many years from Mexico) and cried. I found this right away. I love it. It is a beautiful rosary. It is well made and solid material. We will be using it for many years! I went to the weekly rosary and one of my friends saw mine and said she would like one. I gave her the one I had and ordered another for me. I love it due to the fact that it is petite but not too small. Love it. Makes me want to pray the rosary more. 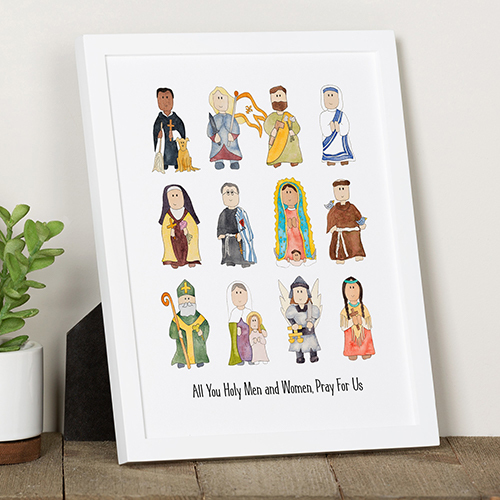 Bought this as a gift for my son at his First Communion. His favorite color is blue :) Excellent quality both of the rosary and the box. Buy with zero hesitations! Beautiful Rosary; I love it. Beautiful rosary and rosary box. 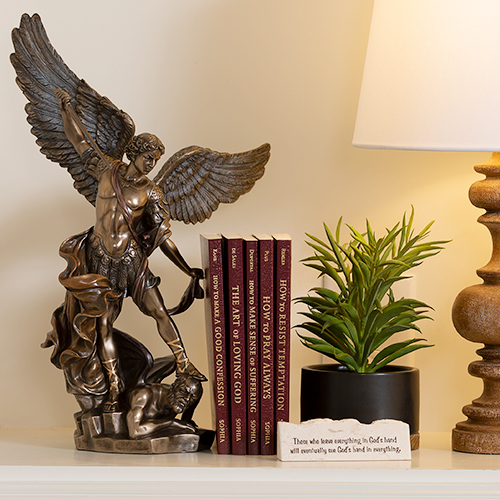 I purchased this item as an appreciation gift and it is beautiful! I will be very happy to see the face of this person who recently made a positive impact in my life. Thank you! This rosary and box is simply lovely. Each person who has seen it greatly admires its beauty. Please do not be put off by the small size. Perfect for carrying in your purse or traveling and excellent to give for First Communion or Confirmation. 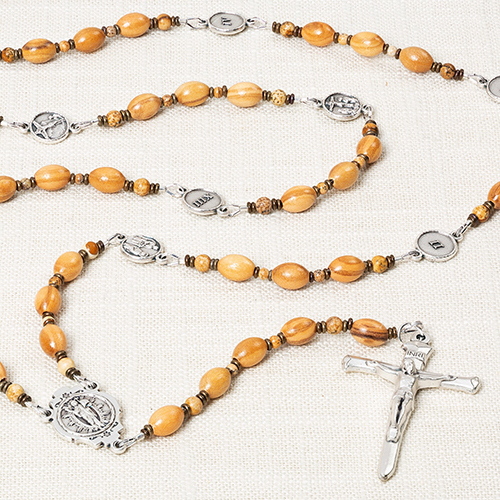 This rosary is beautifully enameled, and small enough for my smaller hands. The box is simply gorgeous. 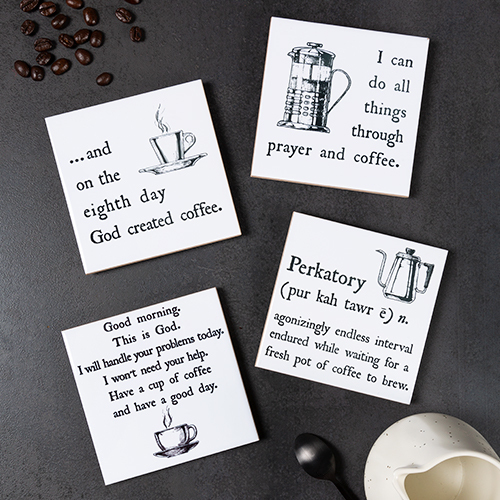 Makes a wonderful gift - that is if you can give it away. Bought one for myself in November, my daughter and grand-daughter wanted mine, so I'm giving them each one for Easter. A great price for such a beautiful item. I have small hands and slender fingers. This rosary is perfect for me. The enamel box is very beautiful. The set is a real treasure. 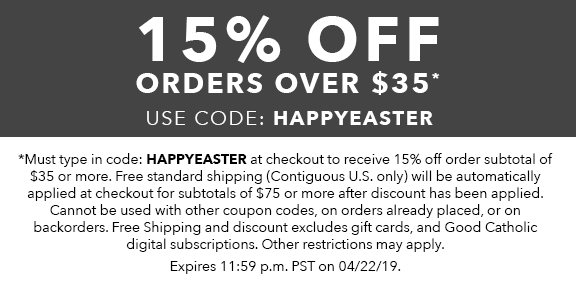 I checked the use of the word "confucimus" with a friend who knows Latin, and she said the word used is a sort of awkward way of getting "we are confused" or "confusion." This rosary's picture doesn't do it justice. Though it was much smaller than I thought it would be, its delicacy, in my opinion, adds to its beauty. 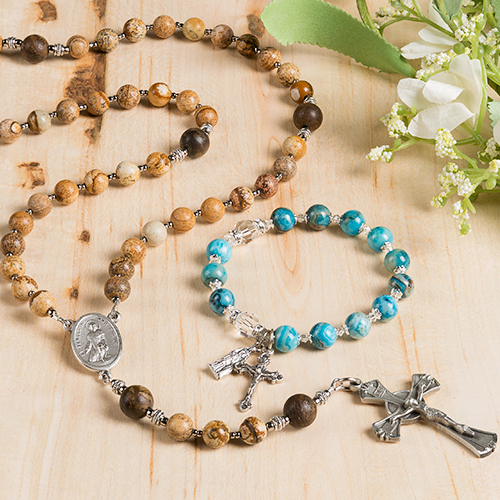 The Hail Mary beads are exquisitely detailed with near-microscopic crosses, and the blue accents on the Our Father beads, centerpiece, and crucifix only make this rosary more beautiful. The box closes tightly, though there may be a misspelling of "confused" or "confusion" in the Latin on the top. Overall, I'm very pleased with this rosary.